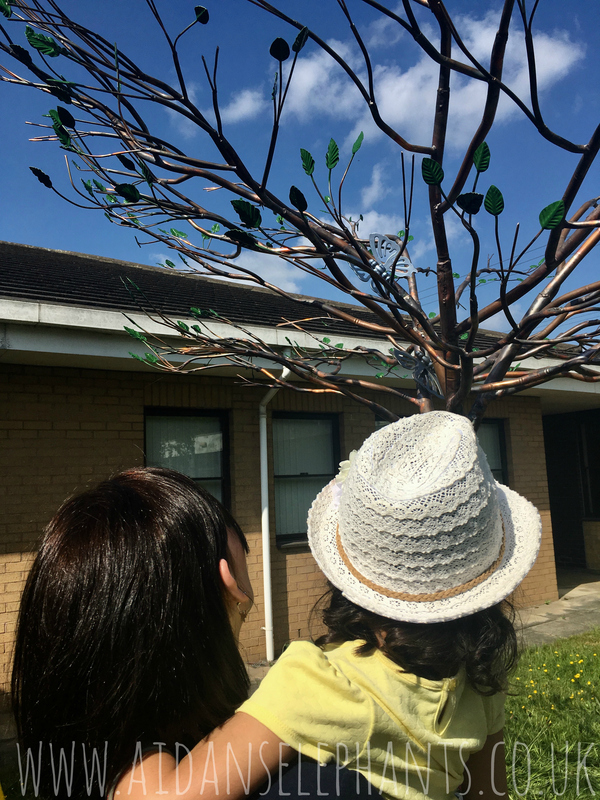 The first Tree of Tranquility sculpture in England was placed in May 2018 within the grounds of Airedale General Hospital in West Yorkshire. The Tree was funded by Aidan's Elephants and it's placement within the hospital grounds was achieved after a six year collaborative project between Aidan's Elephants, Airedale Hospital's Sunbeam (Bereavement) Team and Scottish Charity, SiMBA who have already created and placed five Trees of Tranquility in Scotland. The hospital’s midwives and parents from the Sunbeam Support Group have worked tirelessly to raise funds for and create a beautiful baby remembrance garden to house the Tree of Tranquility. ‘The Sunbeam Garden’ provides a tranquil surrounding for this very special sculpture, a safe and meaningful place where parents can visit to remember and honour their children. 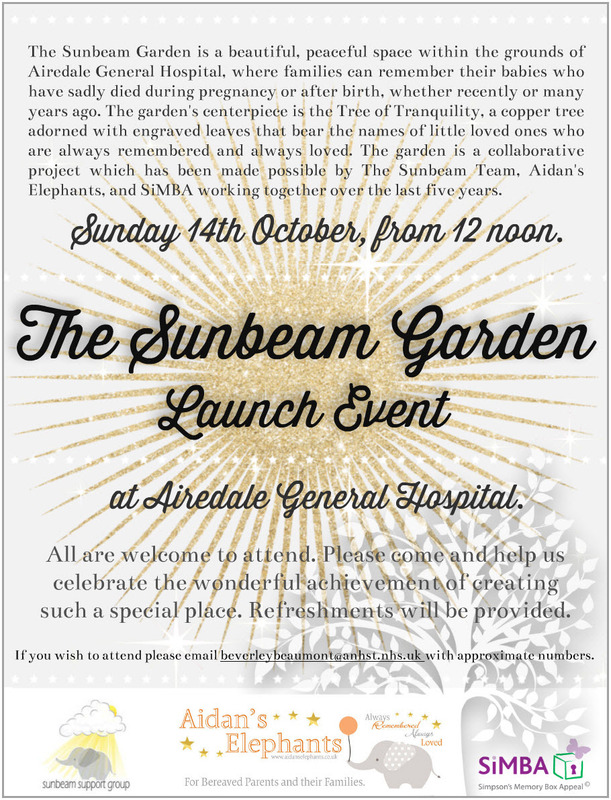 An open day for the Tree of Tranquility and the Sunbeam Garden is being hosted at Airedale General Hospital on Sunday the 14th October from 12 noon. All details in the poster/ graphic attached below. The funding for the Tree of Tranquility was provided by Non Profit Organisation, Aidan’s Elephants. 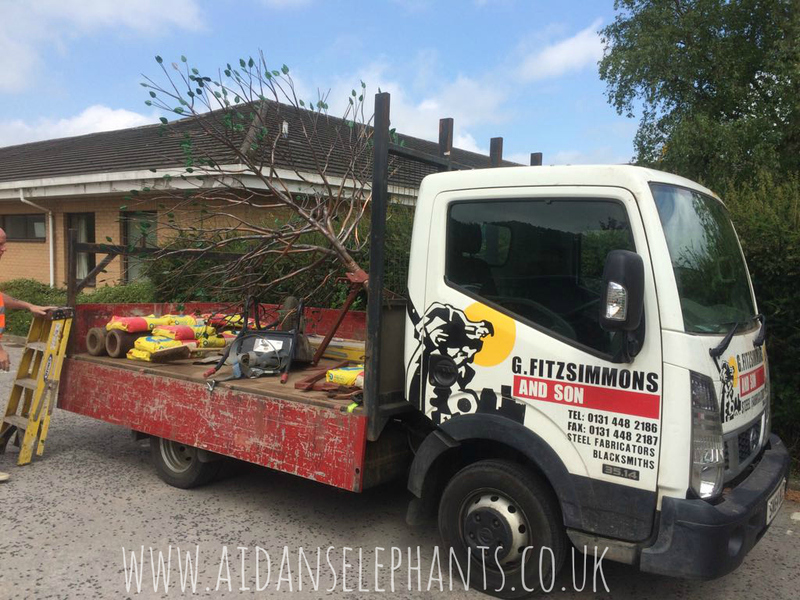 The Tree cost a total of £11,640, which was contributed to by every family who has donated to or fund-raised for Aidan’s Elephants over the last six and a half years. 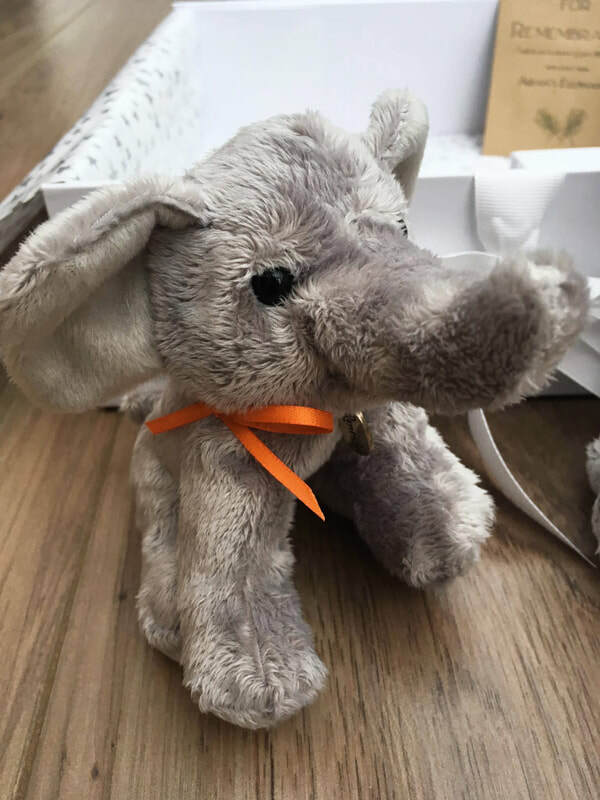 Many families who receive an Aidan's Elephants Memory Box at Airedale Hospital when their baby has died choose to donate to the Organisation in their baby's honour. Helen Chhokar from Aidan's Elephants says, "It is because of these generous families, inspired by their children, that Aidan's Elephants has been able to provide an everlasting memorial structure that other families with benefit from now and in many years to come." The Tree was commissioned via the Scottish Charity, SiMBA, who have provided and funded five beautiful Trees of Tranquility in Scotland (in Borders, Edinburgh & Lothians, Glasgow, Inverness and Orkney). The life sized sculpture is beautifully handcrafted from copper and bears individual copper leaves which can be engraved with personal messages, names and/or special dates. Each leaf represents a forever loved ad missed baby or child. Parents can order copper leaves (at no cost) to have engraved and send back to SiMBA, who will periodically bond the leaves to the Tree. The leaves are individually photographed and sent to parents once their leaf has been bonded, meaning that parents do not need to live locally to be able to order a leaf and have the opportunity to have their child’s name on the Tree. Although parents are not present when their leaf is attached, they are welcome to visit the Tree of Tranquility whenever they wish. Visit www.aidanselephants.co.uk/tree-of-tranquility to order a leaf. Helen Chhokar, Co-Founder and CEO of Aidan’s Elephants. "It is a huge honour to have been trusted with the memorial funds of so many little loved ones, and I feel it is a true privilege for us to be able to put those funds towards creating something so special for a whole community of parents, siblings and their families. Thank you, so very much, to everyone who has supported and continues to support Aidan’s Elephants. It is because of you that we have been able to fund this invaluable project. Beverley Beaumont and Sara Fitzsimmons have worked tirelessly to bring our mutual dream into fruition, the project has taken just over six years and it has been worth every second of hard work. The Tree of Tranquility is part of the legacies of so many treasured children, and will offer comfort to both newly bereaved families and those to sadly lost their children many, many years ago. As parents who have experienced the loss of our own child, it means so much to us that we have been able to play a part in giving families the opportunity to have their children's names placed on this incredibly special sculpture, which stands within such beautiful, safe surroundings. ~ Helen Chhokar, Aidan's Elephants. 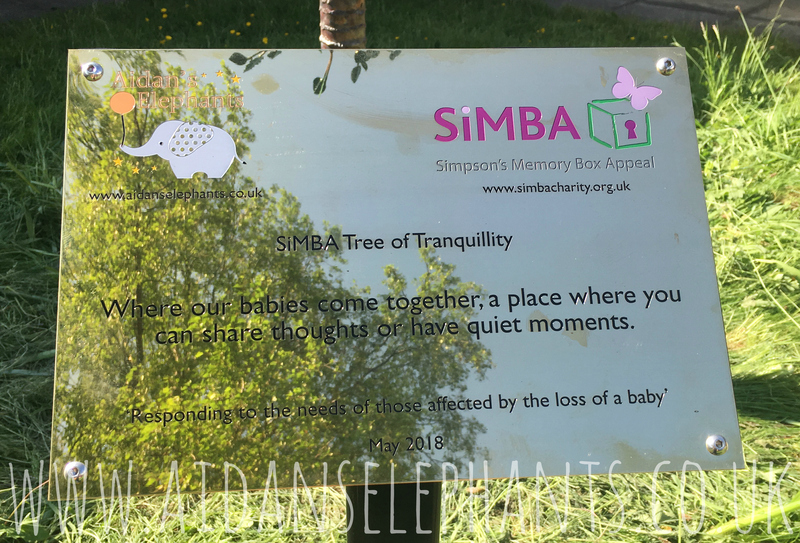 "SiMBA are honoured to have worked very closely with Helen from Aidan's Elephants, and Beverley Beaumont, Bereavement Midwife, Airedale, over many years to bring this mutual vision to a peaceful location, which is a perfect site for this tree. Parents and families have worked tireless through fundraising and donations to bring this beautiful symbol of remembrance to their babies, a place where they can visit and sit and reflect or join others at events by the tree to remember together in a very positive way. The tree, our first in England, shows that working collaboratively, together putting parents and families first and foremost in having a positive place to visit. Every single leaf of the tree will be caringly added by Grant who once the tree is in place, does this on a voluntary basis." Images thumbnails and file downloads. Helen Chhokar and daughter Violet choosing where Aidan's leaf, the first one to be bonded to the Tree of Tranquility, will be placed. 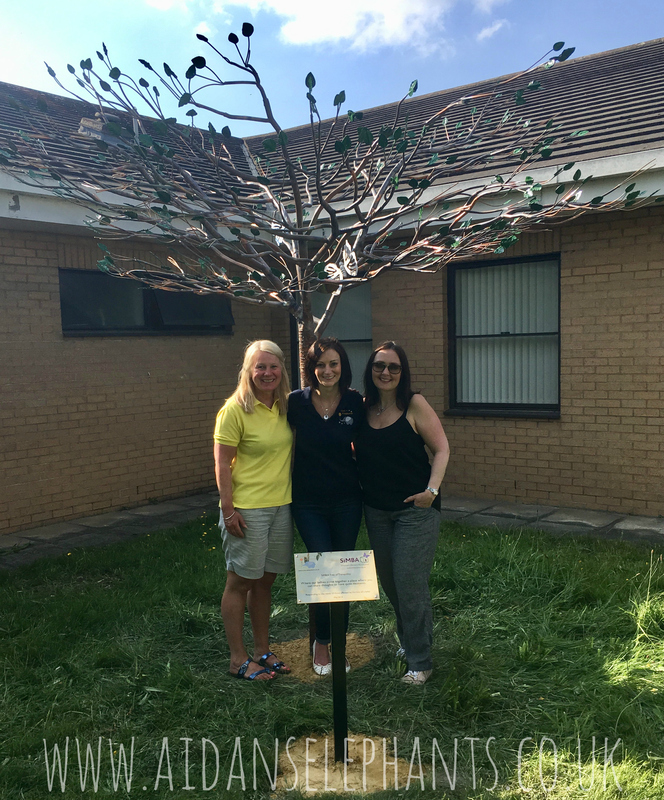 Beverly Beaumont, Helen Chhokar and Sara Fitzsimmons, infront of the just installed Tree of Tranquility which they worked collaboratively on for over five years to have placed within Airedale Hospital's grounds. 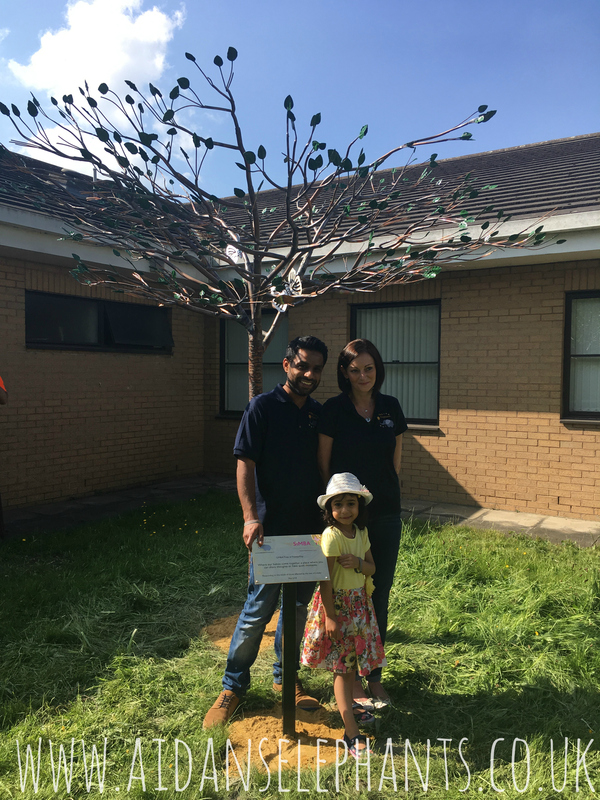 Helen and Gurjit Chhokar with their daughter Violet infront of the just installed Tree of Tranquility, funded by Aidan's Elephants, the Non Profit Organisation that they founded in 2012 in honour of their son Aidan. The Tree of Tranquility travelled to West Yorkshire all the way from Scotland, safely strapped onto the back of a truck, before it was carried by numerous volunteers into the garden and installed by Grant Fitzsimmons, who created it. 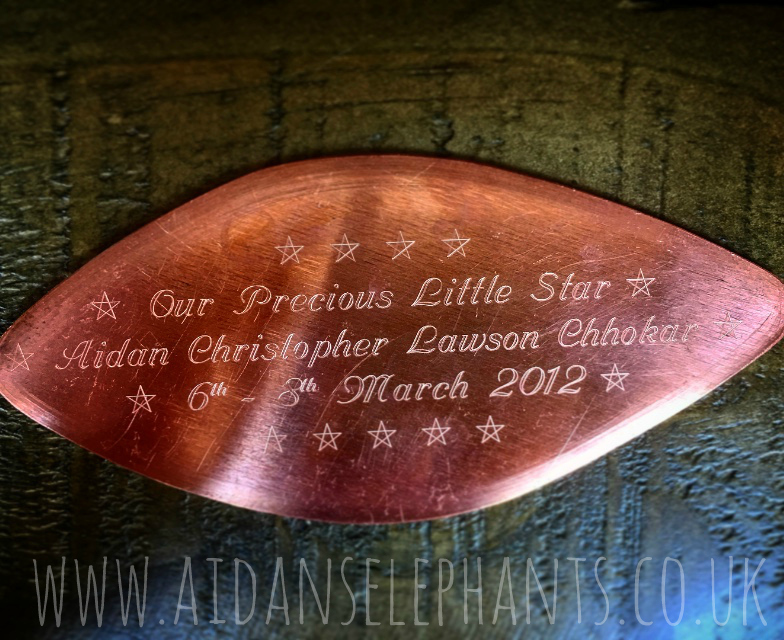 Aidan's copper leaf, which was the first to be attached to the Airedale Tree of Tranquility, followed by so many other leaves which hold the names of precious children who will never be forgotten. A plaque commissioned by SiMBA stands infront of the Tree, bearing the logos of SiMBA who commissioned the Tree and Aidan's Elephants who provided the funding.